In my first blog I wrote short introduction about OpenXML in word processing and how we can work with word documents in ABAP. In this blog I will describe custom xml part of word document and give some examples how we can use it in ABAP. For example how custom data can be used in on demand printing requests to provide customer data in document with content control. Custom XML parts were introduced in Microsoft word 2007 along with Open XML formats. 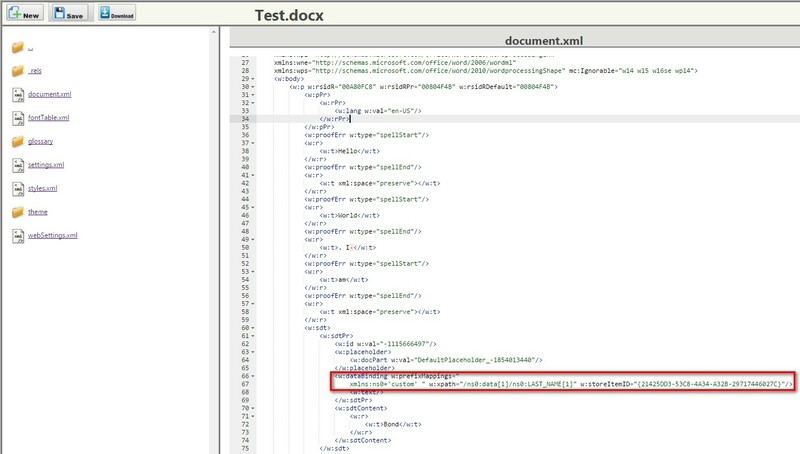 Custom part of microsoft word document is used to store custom data and it is not suprising that data format is XML. In connection to Custom XML we will use also Content Control functionality of Microsoft Word. Custom Control is set of individual objects to control and customize content of the document. One of its purpose is to map data from different sources (in our example from custom XML) to exact place in word document. So let’s go with example. 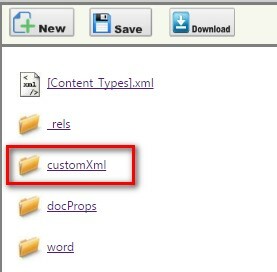 In first part I will show you how to manually create and modify custom xml part. In second part I will provide simple ABAP code which does same. Purpose of this step is to understand custom xml and content control in word. So open our Test.docx document (or create a new one) in Microsoft Word 2007 or above. 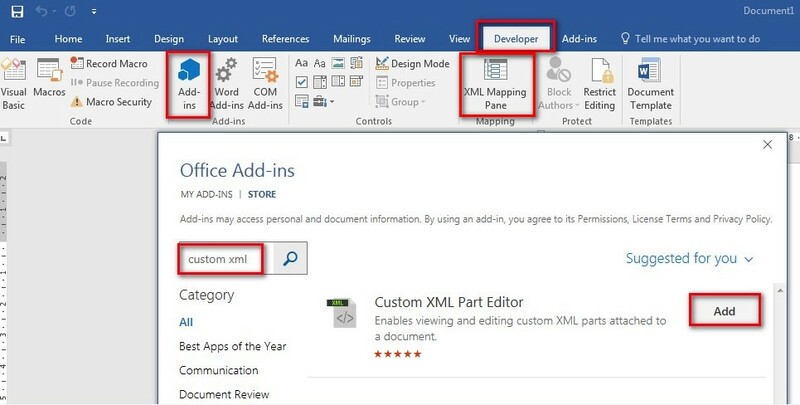 As prerequisite it is necessary to install add-in called “Custom XML Part Editor”. Go to Developer Tab–>Add-in and search it and add. After successfull installation you should see new button XML Mapping Pane. As second step prepare simple custom xml file with some dummy data in XML format. I use following example. Press button XML Mapping Pane to add new custom part. On right side select Add new part… and navigate to our custom.xml file. Aftre adding it now select “custom” part and you should see something like this. Now place cursor on exact spot in document where you want to map data and by right click on attributes (Name, Last Name, Date) select Insert Content Control–>Plain text. Rewrite values of content controls attributes and save document. I added Name and Last name into our Test.docx document. Let’s now check Main document xml part and Custom xml part which was added into document and now will be visible in document structure. For this I use OOXML tool in chrome. Our custom XML part has path customXml–>item1.xml and looks like this. Main part has path word–>document.xml. As it got quick big I will provide only short sample of this xml. please note tag <w:dataBinding> which binds data from custom XML to document. In second part I will provide ABAP code to do same as in first step. Aftre 1st run of program we read word document, create new custom xml part, attach this part to document and save it into same file. Now it is time to manually map data to places where we want them to appear – in same way how I showed in 1st part. Now with second run of report we change custom xml with data we want. *& to attach it to document. DATA: lv_flag TYPE flag VALUE abap_false. lv_it = sy-index - 1.
lr_custom ?= lr_custom_col->get_part( iv_index = lv_it ). FIND FIRST OCCURRENCE OF 'xmlns="custom"' IN lv_string. lr_custom->feed_data( iv_data = lv_custom_xml ). lv_length  = xstrlen( lv_docx ). In my next blog I will describe a way how we can use custom XML to fill tables in word document with own data dynamically. Thanks for your blog. I followed the steps described and achieved the goal of creating a new word document based on a template with content control.